So I’ve had big names before, maybe none bigger with 2 million copies sold by Mr. Wheat Belly. He’s changed the industry in many ways, changes many lives as well. What’s funny is the bigger names I’ve had on the show, to be honest weren’t really good interviews. They seem like, all they want to do is get the interview over. I mean, I understand they do tons of interviews and maybe they even get boring to them, but why would you go on then, don’t you have the obligation to put your best foot forward for those that haven’t heard you? I suppose that reigns true with anything in life, if you’re going to do it you may as well do it 100% or not at all. Dr. William Davis, was a fantastic interview, he clearly cared because before the interview he asked my demographic or who will be listening (which rarely happens), he was clear, didn’t get too scientific as I requested and he was personable. We talked about the conference we were at, his travels and more which again is unlike many big names who just want to get the interview over with. One of my favorite parts of Dr. Davis’ interview is how he talks about paying special attention to products that say ‘gluten free’; I think more times than not we think just because a product says ‘gluten free’ it’s okay to eat, or it’s even healthy. It’s not the case, especially given that ‘gluten free’ has almost become trendy and large companies prey on key words that will get the attention of a consumer looking for something specific. By all means, we still need to read ingredients and more times than not stay away from product because they say ‘gluten free’. What’s great about the world we live in, and what we need to understand, we have the choice to vote each time we visit a grocery store. With each purchase we tell the stores when products we want more of, which we’re will to spend out money on and what we want to see restocked. Be conscious of each decision you make because that decision makes a bigger impact than you realize. 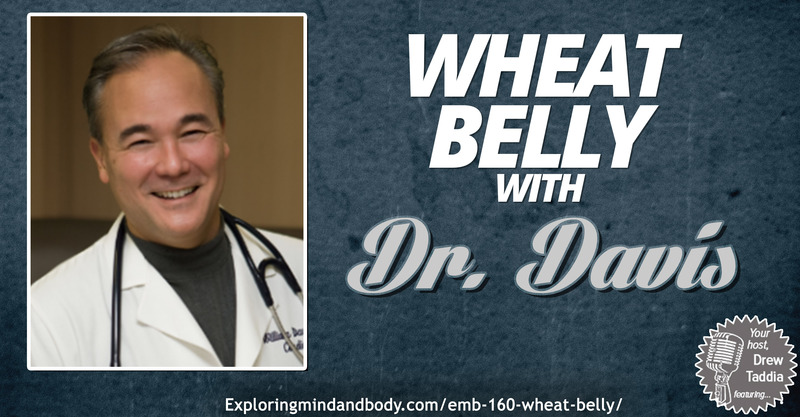 I just to mention a short thank you for Dr. Davis for coming on the show and sharing some of his insights with us on the topic of wheat belly. It really was a pleasure meeting him and talking with him and listening to him say what I feel a conventional doctor wouldn’t. These are things we need to hear and can actually prevent and improve our health instead of ‘treatment’, which many of us are still after. I hope you have the chance to listen to the interview and if you have picked up his book you find more details here at wheat belly. And finally there is on going conversation, tips and information at the wheat belly blog. All the best in finding life changes through wheat belly or other avenues of information and health. Remember small changes are sustainable changes.